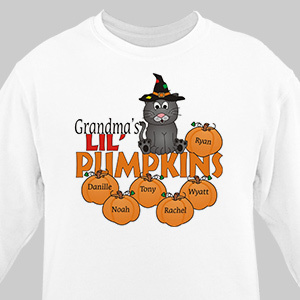 Create a fun and colorful way to show off your children this Halloween with our Lil' Pumpkins Personalized Sweatshirts. Wear this Custom Halloween Shirt as a unique costume or to just hand out trick-or-treat candy. Our Lil Pumpkins Halloween Customizable Sweatshirts are available on our premium white cotton/poly blend Sweatshirt, machine washable in adult sizes S-3XL. Includes FREE Personalization! Personalized with any title and up to 30 Names. My daughter and family loved it. It really brightened her day. It was a a great gift. I am glad I found your site. Additional Details Personalized Halloween Gifts from GiftsForYouNow.com are fun and creative gifts the entire family will enjoy on this spooky holiday. Decorate your home with our Custom Halloween Decor and outfit your children with brand new Personalized Trick-or-Treat Bags.